Let’s begin with a confession. I’m a Gaijin. An outsider that keeps trying to call La Union home, with flimsy claims. Apart from knowing the dialect (Ilocano) and having a family business set up two towns away, I never really did grow up in La Union. But it is where I learned to surf, where enduring friendships have been sealed, and where a bikini top and one slipper have been lost to the sea. Whether on the line up or resting on the shore, all eyes are on the horizon the moment 4pm strikes. You can bet on your bottom sand dollar that the great orange ball of sunset will be hanging perfectly on the sky, illuminating the water golden. At this glorious moment, it is impossible to take a bad photo, but be quick about it because the sun disappears faster than you can choose your Instagram filter. There are two things I’ll wake up early for: An empty line up, and great coffee. El Union delivers perfection on the latter, prepared by hand, with a lot of heart. A warm cup of black coffee before paddling out ensures that your body can keep up with the stoke in your brain, while an ice cold glass of Dirty White in the afternoon ensures that there’s enough fuel in the tank left for your sunset surf sesh. This one is easy to miss, but just as easy to find. Gefseis Greek Grill is along the highway, across the iconic San Juan Surf Resort. Authentic Greek cuisine prepared by a Greek chef is clearly an experience you shouldn’t pass up. Expect to spend like what you would in a Manila restaurant, but it’s the one probinsya meal you’d want to splurge on. This, my friends, is as fresh as it gets. Restaurant tables are right next to the food source–the river mouth that leads out to the West Philippine Sea. Overwhelmed by the menu? Get the River Farm Medley, and ask for extra rice while you’re at it. It takes a bit of time for your meal to arrive as the staff cooks everything upon order, but I promise you that the wait would be worth it. This guy is the best bartender, bar none. And if he likes you, he might just name his latest concoction after you. Find him at the Flotsam and Jetsam Artist Hostel. Drinks best enjoyed with their brick-oven pizzas. When in doubt, Sangria. While Baler’s Sabang Beach boasts a long coastline, La Union offers many different surf spots with varying temperaments to satisfy all levels of stoke. Beginners can enjoy the gentle sand bed of the beach break right in front of San Juan Surf Resort that stretches all the way to Kahuna. More experienced surfers can take on Mona Liza Point where they can expect consistent sets that are great for classic longboarding or shortboarding, depending on swell size. A little further up north is Bacnotan, a picturesque longboarding haven, complete with a dock and a great view of the Golden Hour. Luke Landrigan has become the face of La Union surfing, and aptly so, as the guy worked hard with other local icons to put Philippine Surfing on the international surf radar. But before Luke, there is his father, Brian Landrigan–an Australian who chose to stay here and share his lifestyle with the locals. There’s also Aki San, Brian’s Japanese buddy, who at over 60 years old can out-paddle the rest of us. Nothing beats learning from the best. I always make it a point to paddle out with a local. What started out as a safety concern has lead to endless line-up conversations, deep friendships, and a greater understanding of their lives. I will always be indebted to them for tirelessly pushing me and carrying my board on top of their own waaaaaay before I could catch my own wave. And now that I can, they still always offer to rack my board and strap it down to the car. Such gentlemen! The abundance of abs never hurt. 1. 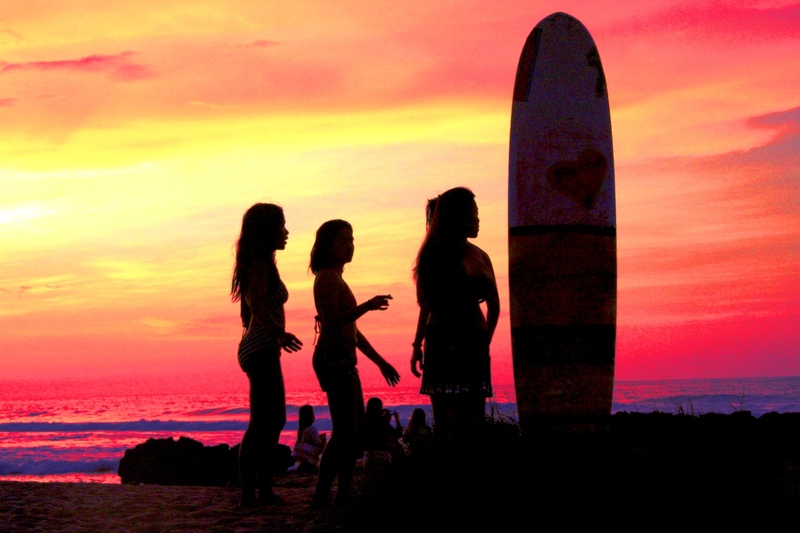 Surfista Travels: La Union! You can experience all these, and more, with the lovely Elaine Abonal. This ball of energy sparkles 24/7 to entertain you, but don’t be fooled–her Mama Bear instincts ensure that safety always comes first. Glowing personality aside, Surfistas also get the BEST loot bags on the planet! First-time surfers only have to focus on getting up that board as everything else is taken care of for you. Long-time surfers are most definitely welcome to join–your chance to finally NOT be the one driving! Most of all, I get to keep new friends that share my passions.